On September 20, 2017 the Human Rights Council held its panel discussion on the rights of indigenous peoples. The backdrop for this event was the 10th anniversary of the adoption of the United Nations Declaration on the Rights of Indigenous Peoples. The panel was headed by Deputy High Commissioner for Human Rights Kate Gilmore who noted that many years ago the chief of the Iroquois, a historical North American native tribe, came to what was then the League of Nations and felt an atmosphere of indifference. This begs the question, how does an indigenous person view the past? And, how does he view the promise of the future? The panel focused on the destruction of “cultures” mainly due to forced assimilation and then it delved into deeper issues such as what does it mean to be indigenous, and how is that term defined? There are many challenges facing the indigenous: the youth searching for identity, economic migration, discrimination, and educational issues. In fact, education should be more culturally sensitive, placing an emphasis on the people’s history in order to maintain cultural distinctiveness. 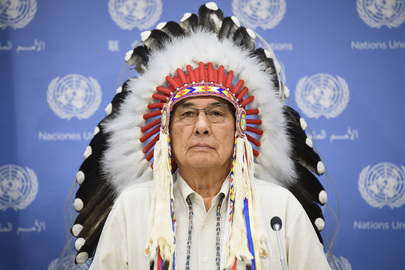 Solutions will take time in order to address 100 years worth of structural discrimination, but Albert Barume, the Rapporteur of Expert Mechanism on the Rights of Indigenous Peoples, was firm in his declaration that mere legislation is not enough to change living conditions. That will depend on the continuing implementation of the legal framework, which will ultimately change the attitudes within society, unburdening the indigenous youth that will be the future of their peoples.